If you havebeen waiting for your chance to learn what it is like to live and work on Marswait no more! The MarsSociety is currently taking applications from the general public, educators,and students to develop the skills necessary to thrive in a regime analogous toThe Red Planet. Crews of dedicated volunteers work in fullsimulation in the canyonlands of Utah in order to conduct fieldinvestigations in the physical sciences and engineering. The MarsDesert Research Station (MDRS) is host to many ?firsts? when dealing with crewsand their research. There were the first all women and all men crews whoresided within the Mars hab. 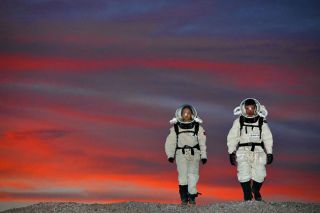 The MDRS has also been hostto the first children to live, study and play while in full simulationduring the Family Living Analysis on Mars Expedition (F.L.A.M.E.) missionsconducted in June 2005, March 2006, and March 2007. The crew isnow planning yet another mission March 1-16, 2008 in hopes to better understandthe human factors side of crews with young children present along with theireducator who will ensure that the students stay on track with their peers backon ?Earth?. With webcams all around the Hab, both inside and out, students fromaround the world can view the F.L.A.M.E. students living and going to school on?Mars?. They can even send questions and proposed experiments to the F.L.A.M.E.students but will have to wait the 49-minute lag time for messages to bereceived and sent from Mars. Currentlythere are several open mission rotations available for individuals who areinterested in forming crews and going to the Mars Hab. Volunteersshould state clearly whether they are volunteering for MDRS, and what segmentof this span they are available. Both volunteer investigators who bring withthem a proposed program of research of their own compatible with the objectivesof the MDRS and those simply wishing to participate as members of the crewsupporting the investigations of others will be considered. Research proposalswhich focus the effort of or require selection as a team of up to the fullsix-person crew will also be considered. Applicationswill be considered from anyone in good physical condition between 18 and 60years of age without regard to race, creed, color, gender, or nation.Scientific, engineering, practical mechanical, wilderness, and literary skillsare all considered a plus. Dedication to the cause of human Mars exploration isan absolute must, as conditions are likely to be tough and the job will be verytrying. Those selected will be required to participate in certain crew trainingexercises and to act under crew discipline and strict mission protocols duringthe simulations. All ofthose selected will also be required to sign a liability waiver. The MarsSociety will pay travel and related expenses from Salt Lake City, Utah duringtraining and simulation, but there will be no salary. Applications includingresum?, character references, and a brief letter explaining why you wish toparticipate should be sent to Mars Society, PO Box 273, Indian Hills, CO 80454.Total length of applications should not exceed three pages. Please include ninecopies. VeronicaAnn Zabala-Aliberto is a National Space Society Board of Director (Region 3),NSS Phone Tree Coordinator, NSS Phoenix Chapter President and is on several NSSCommittees such as the Chapter Projects and Events, Policy, Strategic, andSpace Book Committees. She is also the Founder and was Chapter President of theMars Society of Phoenix, Arizona from 2000-2006 and is now the EducationOutreach Coordinator for that Chapter.